As an artist, I am drawn to incidences where the domestication and wilderness overlap and interact. The work I create takes various forms from sculptural installation, video and sound works as well as photographic studies and series. My current work draws from my experience visiting and photographing a parcel of forest fire land in Washington USA over the past year. 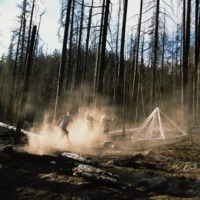 The photographs include geometric sculptures and mythic performative acts by my sons that respond to the desolation of the forest while acknowledging the impending growth just beneath the surface of the land. The work is a study in the silence and death encapsulated in forest fires as an inside-out look at traditional views on the sublime and beauty in the wilderness. Anonymous, “Zack Bent,” Artist Parent Index , accessed April 22, 2019, http://www.artistparentindex.com/items/show/150.